NIMBUS elevates the signature Exponential Audio reverb engine with surgical controls and timbral effects. Authentic, classic tone meets advanced filter mechanics, compression, overdrive, tempo-syncing, and warp effects, so you’re sure to have the perfect reverb for your music. 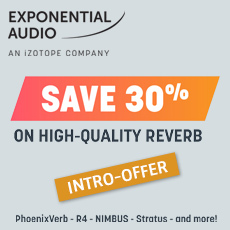 NIMBUS gives you comprehensive control over the tone of your reverb while maintaining the authentic reflection clarity pioneered by PhoenixVerb. By introducing filter slope and frequency controls for the reverb signal’s attack, early reflections and tail components, as well as overdrive and compression modules for the global reverb signal, NIMBUS lets you color the tone of your reflections with outstanding accuracy and precision. Crisp reverb tone with your own unique signature - Exercise complete control over your reverb timbre with six filter types for your early reflections and reverb tail. NIMBUS offers an Attack module with four reverb types, Tail control with independent delay, suppression, and recovery parameters, and Early control over the reverb algorithm pattern. Tempo-sync your pre-delay and reverb delay - NIMBUS just got a lot more musical with tempo syncing! Select the rhythmic note value you want, then either tap in the beat or have it follow the tempo set in your DAW to quickly lock in your reverb timing. Warp: color gently or mangle dramatically - NIMBUS’s Warp effects provide exciting creative tools to add character and sophistication to your reflections. Use the Overdrive module to introduce expressive harmonics or edgy, aggressive resonances, or use the built-in Compression module to shape a more consistent and powerful reverb tone.